Lots of people struggle with how the Irish language is pronounced. Let’s take a short example, and break it down! Once you get familiar with the rules, other new words won’t look so strange. You see, when you break things down into Bitesize portions, they’re not so daunting. 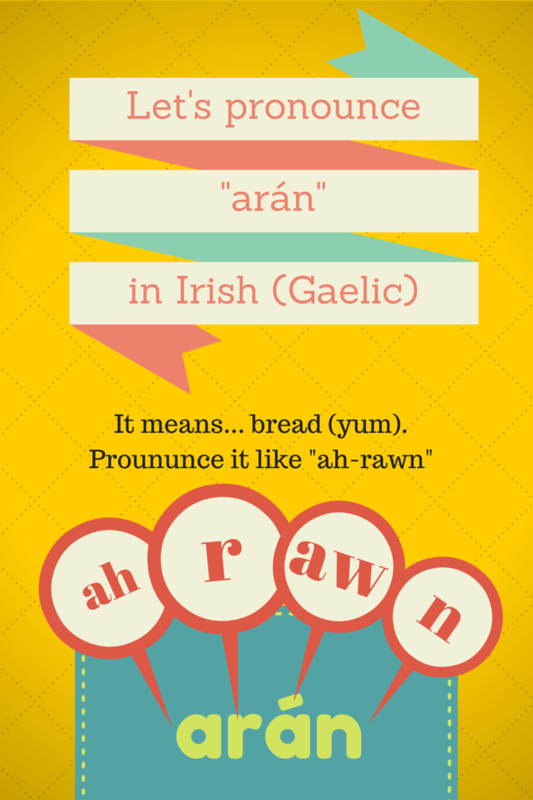 You first might have no idea how “arán” should be pronounced, especially with that “á” thrown in there. Now you know it’s pronounced like “aw”. It’s a “long vowel”. (Bitesize members should see Bitesize Lesson: Pronouncing long vowels). Did you find this helpful? What more questions do you have on pronunciation? Leave your reply below! P.S. If you haven’t yet come across our popular Pronunciation Cheat Sheets for Irish Gaelic product, this might be a good time to check it out. Hi Lisa, I lean towards the AWE pronunciation of “á”. That being said, the Ulster dialect of Irish can sound more like “ah-rahn”. So don’t be hard on yourself 🙂 You’ll be understood if you make the effort, that’s the important thing. Pronunciation of a multisyllabic word: I had received the impression that the correct way to pronounce an Irish word of more than one syllable was on the first syllable. However, I find myself really tempted to stress the first syllable with a long vowel in it regardless of where that syllable comes. If there’s a word of more than three syllables in length, I feel that there must be stress someplace after the first syllable. I also run into trouble with words which end -eoire. Thanks for the opportunity. For this word in particular, in any case, my emphasis is on the “á” syllable. I’d be interested in whether someone has documented the emphasis patterns for different types of word. I did wonder, Eoin, just how much trouble you found it to transcribe an Irish word into an English sound phonetically – but had forgotten that you have to add the Australian or American or whatever variation accent over all that – bit of a nightmare really. But keep doing it, the chart looks good. I joined a little Irish conversation group and every now and then am brave enough to throw in a phrase – there is a few seconds delay while the Irish native speakers concentrate and translate my Australian accent into what I hoped it would say, and then all smiles and agree! Good fun! And thanks for your work, the podcasts are fascinating. You’re not the only Australian learner! Well done Julie. It’s lovely to hear that you’re making the effort to call into a group, despite technical difficulties. Thanks for the extra tidbits you give. They are so helpful. How is this different from aran yarn? Are they pronounced the same? I presume that’s Aran wool, which is used to make Aran sweaters, right? In the Irish language, the Aran Islands are called Na hOileáin Árainn. In the English language, you just say “Ah-ran”, as you’re read “Aran”. I hope that helps, good question. Hi, I have lived in Ireland for the past 11 years, I’m originally from Slovakia. Now, that I have kids and my husband is Irish we have decided to put our daughter to an all Irish school. I’ve been trying very hard to learn with her. I spent hours trying to find the best resource to learn. I find the Bitesize Irish very helpful, however, I was wondering if you could recommend an audio based learning – a book recorded with pronouncietion in Irish and explaining in English. Lots of other languages would have something like that available for purchase, unfortunately, I can’t find anything like this in Irish. Would you be able to recommend something? Also, a book to follow for an adult beginner would be handy. Thank you. I look forward to hearing back from you. That is really great that you are learning Irish together with your daughter. The product is delivered in the format of MP3 files and accompanying PDF text of the lessons, perfect for copying to your iPhone, a CD, or your MP3 player. It’s 15 hours of lessons and has over 90 lessons. And any chance I can hearrange a sample recording for:How are you? My name is… and thank you? As I have listened to sone samples online (No you can speak Irish..and some others) and the dialect can vary a bit.. I know I would be understood either way, however I want to be able to learn in the same dialect as my daughter.. I would suggest that you sign up to our free trial where you will be able to hear these audio files and to see how these sentences are written.